Displayed as images, this index contains a collection of all the charts, tables, diagrams and more original content we have put together over the years! In the table above, the top row indicates the length of the tank, the left vertical column indicates the depth (height) of the tank. To determine the glass thickness to use for constructing your tank, find the length of the tank in the top row (indicated in feet and cm - centimeters), then follow that column down until you reach the height of the tank (indicated in inches and cm). Glass thickness is indicated in mm (millimeters), with the number in parenthesis below indicating the Safety Factor. 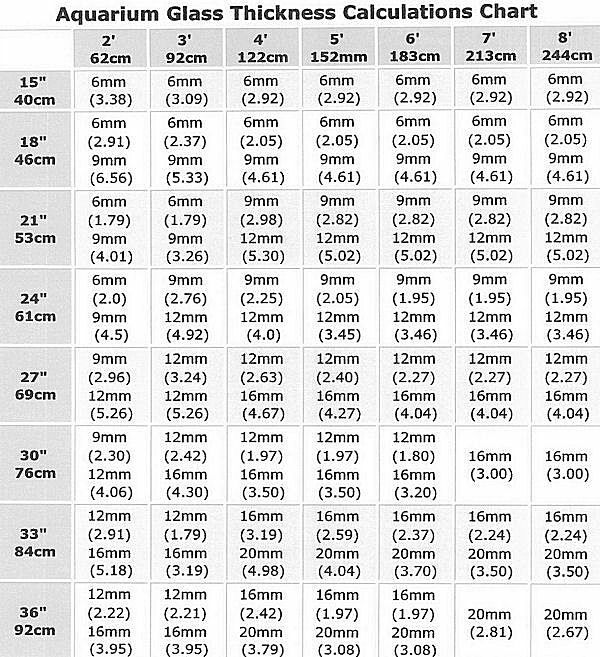 Below, is a quick conversion of millimeters to inches. This is a four view diagram that illustrates step-by-step DIY glass aquarium assembly instructions. So what do marine fishes eat in nature? This table of the primary food groups of marine fishes in nature briefly describes what each group eats. Also see: What Marine Fish Eat In The Wild. This table shows the values of top major and minor elements as well as related compounds (all mainly ionic) found in natural seawater (NSW) that are considered to be essential for saltwater aquariums. This table can be used as a guideline to compare these elements to those contained in sea salt mixes when choosing a mix to buy. Note that values obtained from different sources vary, as values can change from test to test for different reasons, but for the most part these values reflect the overall average measurements from various resources referenced to formulate this table. Although these compounds of common elements are present and harmless in natural sea water (NSW), they are often found at undesirable higher concentrations in some sea salt mixes. Therefore, these elements should be considered when choosing a mix to buy for making up aquarium water. To help you easily compare the differences between essential elements contained in some of the top brand name sea salt mixes sold on the market, we compiled this quick reference elements comparison table based on actual test results that were conducted by the Hawai'i Institute of Marine Biology reported in Marlin Atkinson and Craig Bingman's "The Composition of Some Synthetic Seawater Mixes" article published in the March 1999 issue of Aquarium Frontiers Magazine, and in reference to other Web resources. Although there are other elements and compounds to evaluate when buying a sea salt mix, in this table we only address those considered to be primary. Refer to Marlin Atkinson and Craig Bingman's The Composition of Some Synthetic Seawater Mixes Report for more details on Buffer System Components in relation to pH factors (see Table II), Nutrients (see Table III), and Trace Elements (see Table IV). The codes in this table reflect our own interpretation of the test results from this report. Also keep in mind that since the tests were conducted, some manufacturers may have made changes to their formulas. ... most essential for saltwater aquarium systems. Therefore, these elements should be considered when choosing a sea salt mix to buy for making up aquarium water. Note that values obtained from different sources vary, as values can change from test to test for different reasons, but for the most part these values reflect the overall average measurements from various resources referenced to formulate this table. References: Periodic Table of Elements from Faculty of Chemical Technology, Croatia, Periodic Table of Elements with Seawater Additions by Pat Wilde, Periodic Table of Elements from WebElements, and other Sea Water Composition & Salt Mix Resources - Books: "The Marine Aquarium Handbook" by Martin A. Moe, Jr., and "The New Marine Aquarium" by Michael S. Paletta. This diagram above demonstrates the system set up with all the back flush valves in place. The system is running as it normally would. The back flush set-up remains attached to your system once you have installed it. This diagram demonstrates how the quick disconnect valves are closed and opened. The system is in the reverse flow back flushing mode. Bring out the bypass valves from storage when you want to back flush. Just turn the flow off at the double valves, disconnect them, connect the single valves, then turn them all on. You simply put a bucket under the wastewater vent hose and switch 3 valves. This reverses the flow through the filter. Once a month during your regular maintenance routine just back flush the system for about 30 seconds or so. This should be sufficient to loosen up the bio media and wash through any detritus or organic buildup trapped. After you have achieved the desired effect, switch the valves back and the filter runs normally. There are a number of differing opinions on the exact "right levels" for the basic water parameters in a saltwater aquarium. The table below gives you a good idea (suggested level average) of what to strive for in your aquarium for the desired results. Note: After the tank cycles we suggest that you run ammonia and nitrite tests every other day for a week, and anytime after adding new fish, corals or other marine life to your tank. Glass aquariums can be strengthened by using braces (usually glass strips) across the top of the tank. The use of braces can allow the use of thinner glass. Marine fish have figured out how to stay alive in the oceans for literally millions (billions?) of years. If they hadn't, quite simply they wouldn't be here, now. Each species developed a method for surviving, whether it was a really great defense mechanism (i.e. the Volitans Lionfish and its poisonous spines), schooling (spreads the risk of an individual being eaten), the ability to hide from its pursuer (in rocks or corals), through symbiotic relations (the Clownfish wouldn't be around if it wasn't for anemone) or just the ability to be able to flee. Taking a fish out of the ocean and putting it into a closed system, such as a home aquarium, greatly reduces a fish's ability to flee or hide from predation. At the same time, it also increases the competition for whatever food is available. The chart above will give you an idea of which fish can and can not "normally" exist together in a closed space. In many cases it also indicates which will coexist with a certain amount of caution. Nothing is guaranteed. There will always be exceptions to any generalization, but the chart will give you a place to start when you are trying to figure out what will work in your aquarium. For more information about a specific species, refer to their profile information. Read on for more Collection Net Instructions.